Father Paul joins us for Palm Sunday as we begin Holy Week by celebrating Jesus’ triumphant entrance to Jerusalem. In the First Reading, Isaiah says the Lord has given him a well-trained tongue so that he may speak to the weary in a way that inspires them. God opens Isaiah’s ear that he may hear, and Isaiah has not rebelled. He did not run or hide from those who would persecute him for proclaiming God’s Word. Isaiah is not disgraced because God is his help. Isaiah knows he will not be put to shame. In the Second Reading, Paul tells us that even though He was in the form of God, Jesus did not believe His equality with God was something to take advantage of. Instead He came down from heaven and took on human form. He was obedient to the Father even to the point of dying on the cross. Because of this, God greatly exalted Him and gave Him the name above every other name, that at the name of Jesus, all will bow down in worship. Everyone in heaven, on earth and under the earth will confess that Jesus Christ is Lord, to the glory of God the Father. 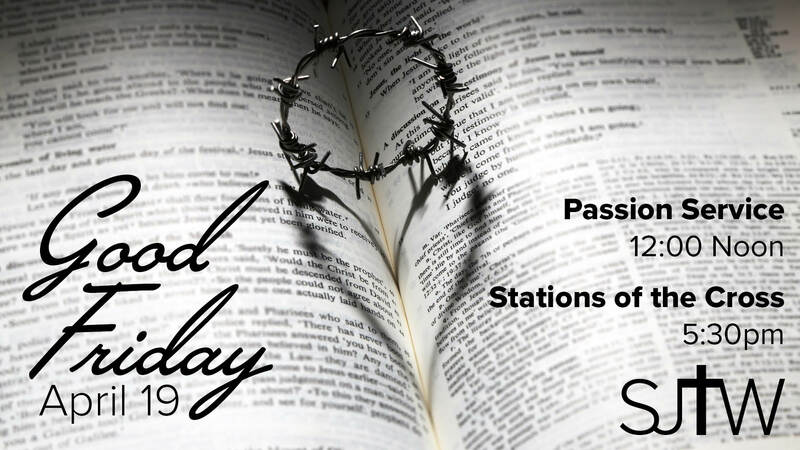 Together we will read the Passion of our Lord Jesus Christ according to Luke. This is the story of Judas’s betrayal of Jesus, the story of Jesus being put on trial and sentenced to death. He will be abandoned by His disciples. Peter will deny knowing Him. Jesus will verbally and physically abused and left hanging on the Cross. He will then be buried. This is the story of the greatest act of love in human history. This is the story of our salvation. Follow along during the Passion. The congregation will read aloud the part of the Crowd in the Breaking Bread books. The responses will also be on the screens. There will be Children’s Liturgy of the Word at the 8:30 and 11:00 Masses. All kids between the ages of 5-10 and their guardians are invited to Martin Hall before the First Reading. 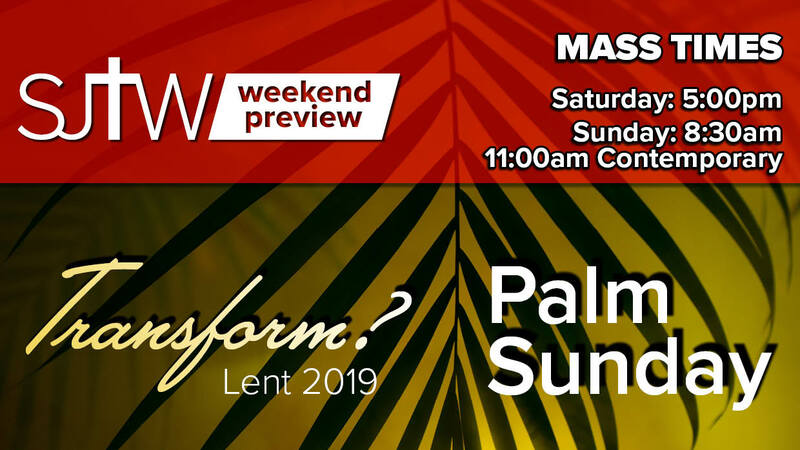 The palm branches will be blessed after the first Gospel reading at the start of Mass. We will then line up like we do at Communion to receive our palm branches. Reconnect with the Passion and Death of Jesus. Reconnect with Jesus for healing and power. Reconnect with others as a witness to my faith.